I made a fun Grad card for my nephew Ed's in his college colors- for my Mother to give to him. I used a grad embossing folder for the background on Marina Blue cardstock. Paper Studio DP and a recycled grad hat image. It is the 28th, and that is the day we post our Challenge Your Stash (CYS) Challenge cards. Pansy (aka C-mouse at Splitcoaststampers.com) challenged us to use a mouse on our cards. 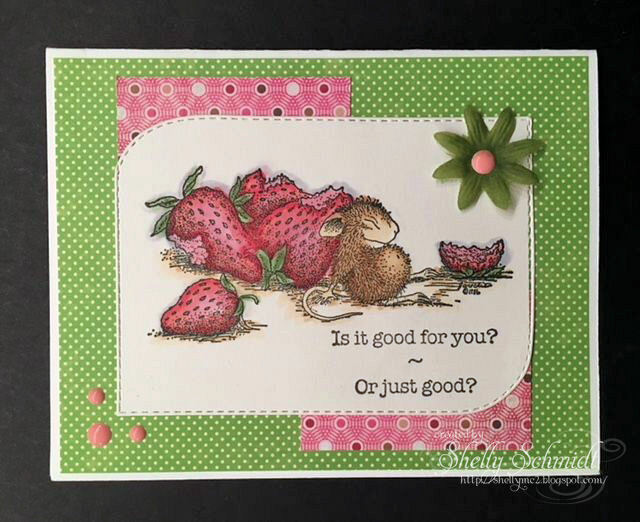 I really LOVE House Mouse images and have a small collection- which I should use much more often : ) This cutie pie is called Sleeping with Strawberries and is by Stampabilities. 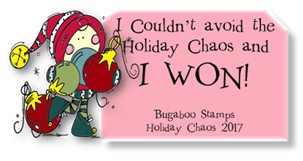 The sentiment is by Unity Stamps. I stamped the image onto Cryogen White cardstock- which has a touch of sparkle to it, and colored it with Copic markers. I cut the image out with a MFT die, and moved the die up and ran it through the Big Shot again, cutting off approximately 1/2-3/4" or so off the bottom. The green DP is from Jillibean Soup from 2011 and the pink is Basic Grey from who knows when. I added the flower which I colored with a Copic marker to match more closely and embellished it with an enamel dot. The CYS group can be located here. List mom Barb had the brilliant idea- lets use our stash items- with a monthly theme, I am sure finding no shortage of items to use in my creative space for this challenge...!!! Even those in the 'get rid of' pile....... 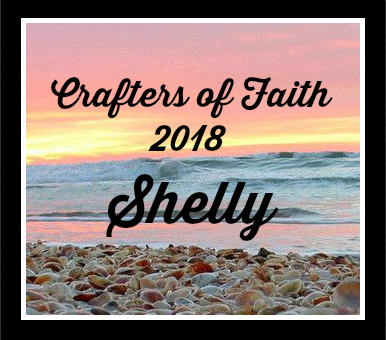 HERE is a link to all of the May cards at Splitcoaststampers for this challenge. Cards we never like making are Sympathy cards. Yet, they are so special and meaningful. I used very shimmery cardstock in a soft purple color. I cut out a die using the same cardstock. The butterfly is Sweet Stamps and is stamped in Versamark and embossed using silver EP. 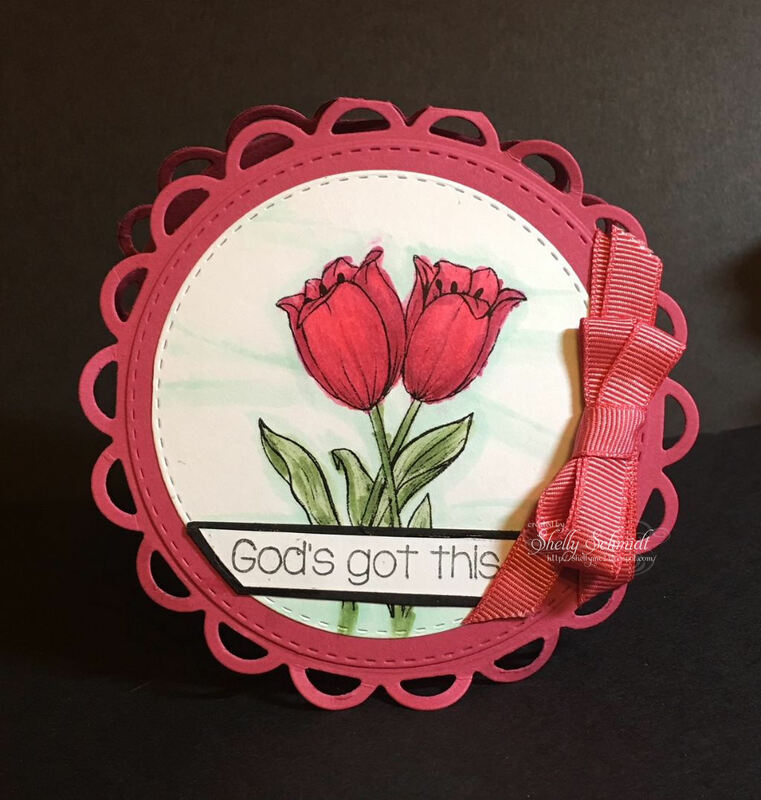 The sentiment on the front and inside is a set by Gina K Designs for Unity Stamps. I added just a touch of Sakura Gelly roll pen in Stardust for subtle shimmer. Heather and I are pleased to bring you our May kit : “A Spring Tweet”. Spring has been a long time coming! It feels like the snow is lingering and the weather just refuses to warm up! Our feathered friends often bring those first signs of spring, so we’re ready to encourage them along this month! I added SU cardstock Not Quite Navy and Perfect Pear cardstock from SU for the backing. The sequins are a perfect green to coordinate with the cardstock. I just missed the mailman, know just who I m sending this card to! 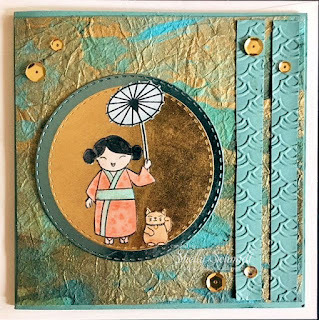 We have a monthly Sketch challenge at AOSA (About Oriental Stamp Art) that I participate in, and I had fun creating this card for the April Sketch. 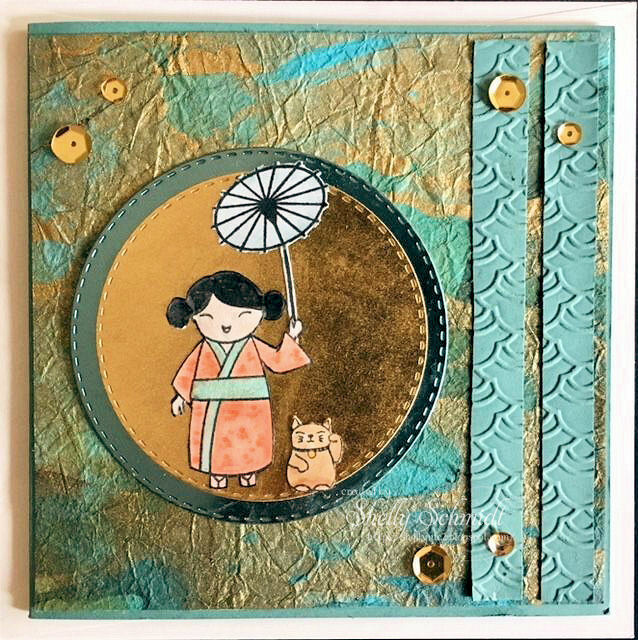 This fun Geisha is by Essentials by Ellen. This card is so shimmery it was very hard to get a picture of.... The background- Washi is from an Estate sale. I adhered it to a piece of cardstock, and trimmed it out. I matched it with a cardstock from SU- not sure of the name..... it was an in color recently. I ran a couple of strips thru an embossing folder for the 2 side strips . For the circle embellishment, I cut out 2 stitched circles and layered them, then added the fun images. I added gold sequins for embellishments. The images were colored with Copics. This pic is a bit bright, but I had to settle here with the pic with the metallic cardstock. We are making Shaped Cards for the Tuesday Throwdown challenge today. 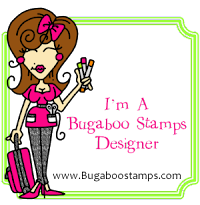 Our Sponsor is Sweet n Sassy Stamps. I used the Sweet n Sassy Tulips Digital Stamp. The image is colored with Copics, I used the stich framed circle dies for white inside and out and the pink. The back scalloped edge die is Spellbinders. The ribbon is SU. Scripture: NLT: Kind words are like honey— sweet to the soul and healthy for the body. I started off using the colors Yellow and Black, Yellow in Distress Oxide ink, then I had to add in a few more colors. The Black came in with the stamping of the flowers. Before I stamped the image, I spritzed a stencil and placed it down into the distress cardfront, making an impression of the stencil. I stamped using a floral image from Lawn Fawn (Flutter By). 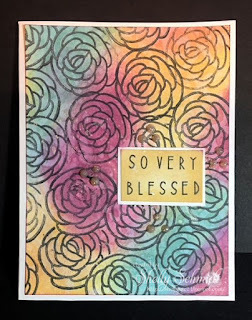 I masked and stamped repeatedly using Nuvo Hybrid Ink pad (Sparkle and Sprinkle. I added drops of shimmer (old/retired SU spray). I also added Nuvo glitter drops in Honey Gold around the sentiment. I have a dear friend on my mind to send this card to: ) She has alot on her plate- her husband is very ill, and relies fully on God and is so inspiring to me! He strength is unbelievable! I hope it puts a smile on her face! I used the April KOTM to make my ATC's for the Unity Swap this month. I stamped the pear image in Black Memento Tuxedo ink, and colored it using Artesa water brush pens. 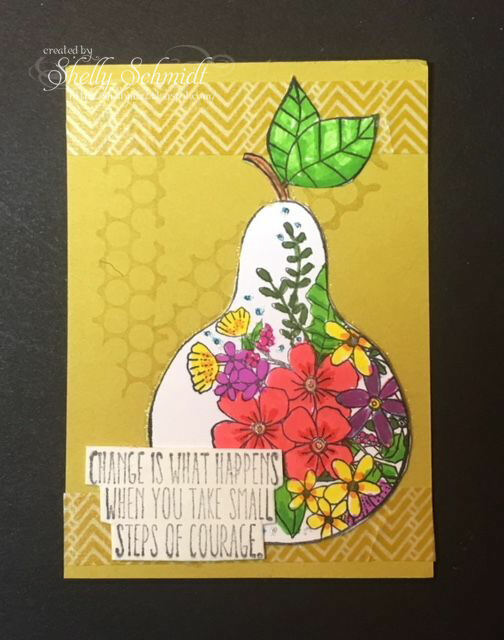 I outlined the pear with a Sakura Starburst Gelly roll pen. I used a SU color that I have not cut into for which I have Washi that coordinates beautifully. The watermarked stamp in the background is from a Unity grab bag. This ATC uses Distress Oxide inks. First, I stamped the bee image, and then a mask on a post it note. 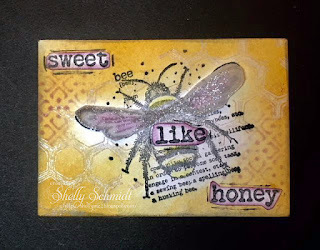 I aplied the background stamp and embossed it using clear embossing powder. I inked up the background using Honey Distress Oxide ink. Next, I placed a stencil over the corners of the ATC and used Purple Distress Oxide ink and sponged over it. 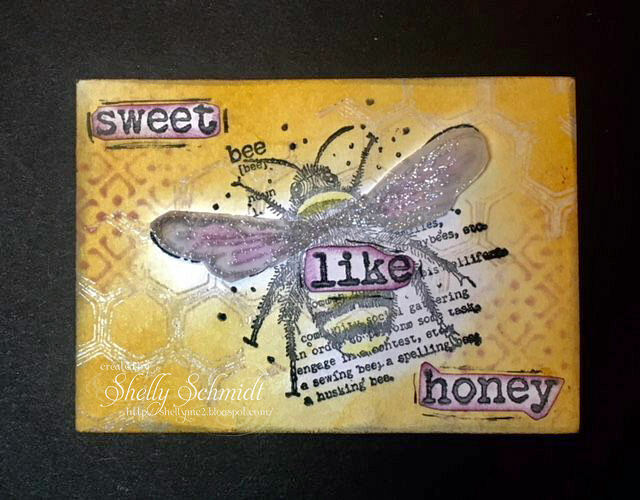 I stamped the bees on Vellum, and cut out just the wings. The base bee has a touch of purple ink on it as well as the underside of the vellum. The top of the vellum has Wink of Stella on it for shimmer. And, I have swapped 2 ATC's with 9 other crafters, so my desk is just covered with ATC's. I cannot put them away yet- too fun to look at!